Catch Carp Spain is a passionate and professional guiding company situated on the banks of Lake Orellana in the Extremadura region of Spain. Our carp fishing holidays are the ultimate specimen carp fishing adventure in Spain. Access to the Extremadura region is through 3 of Spain’s main airports – Seville, Madrid, and Malaga with many cheap carriers doing regular flights from the majority of European airports. Finding us here at Catch Carp Spain couldn’t be easier. We would advise clients to drive here as public transport can be very challenging especially where you don’t speak Spanish. The Extremadura region of Spain is the Mecca of Spanish carp angling. Carp fishing in Spain does not get better than in Extremadura. The region has 3 or 4 of Spain’s top carp waters and has two of the country’s largest rivers running through the region. The jewel in the crown of the region is Lake Orellana on the Guadiana river system. As with most of the waters in Spain this incredible lake has been under the radar for many years. That is all about to change as the news of 30kg plus uncaught carp has finally started to find its way to the larger carp angling community. The secret is out. If a specimen carp angling adventure on a breath-taking water is what you’re looking for the Extremadura region of Spain is the place for you. Lake Orellana is Spain and possibly Europes’ premier specimen Carp fishing venue. It is located in the Extremadura region of Spain and was created from the damming of Spains’ fifth largest river. This is every carp anglers dream location. Catch Carp Spain has spent the last 10 years researching this unbelievable body of water to find the best fishing locations for our clients to enjoy. Sierra Brava was originally stocked in 1996, approximately 15,000 common and mirror carp. These fish are already reaching the unbelievable size of over 70lbs. As you might expect, there is a real buzz in Spain about this incredible fishing holiday location, with anglers coming from all regions of Spain and Europe to fish the water. 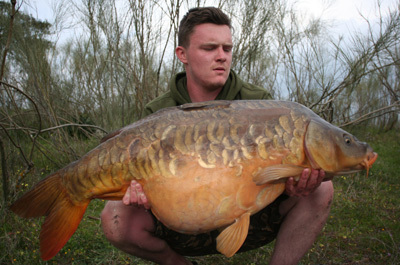 So come and have a go for that fish of a lifetime with Catch Carp Spain. Catch Carp Spain is a passionate and professional guiding company situated on the banks of Lake Orellana in the Extremadura region of Spain. 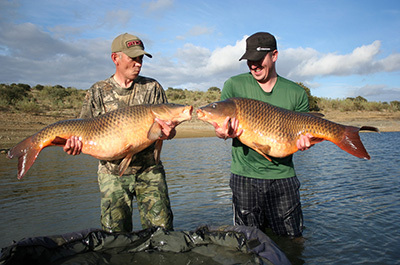 Our carp fishing holidays are the ultimate specimen carp fishing adventure in Spain. We have over 10 years’ experience of carp fishing in the Extremadura region of Spain to draw from. From our base in the beautiful town of Orellana Catch Carp Spain has spent the last 10 years researching and locating the best carp fishing in Spain with unbelievable results. 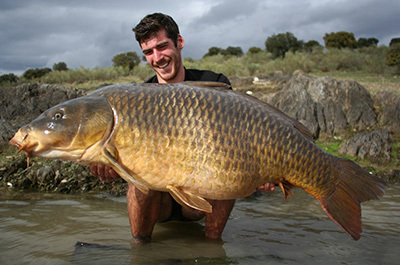 We can offer carp anglers of all abilities a carp fishing holiday in Spain that you will never forget. Our packages at Catch Carp Spain are designed to help you get the best from your carp fishing holiday. The Extremadura region of Spain is recognised as one of the top specimen carp fishing locations in Europe with outstanding natural resources and beauty. Catch Carp Spain specialises in the waters of Lake Orellana where it is still possible to catch some of the biggest uncaught carp in Europe. 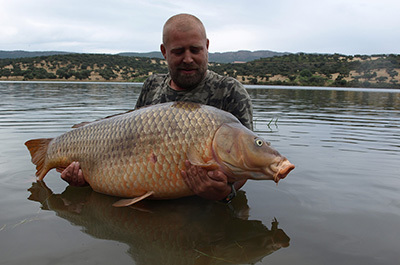 The carp fishing Spain experience on Lake Orellana and Sierra Brava gives anglers the opportunity to target these specimen carp with Catch Carp Spain. With Catch Carp Spain fishing holidays you’ll be supplied with the best equipment for the job and guaranteed to receive professional advice and guiding to give you the best possible opportunity to catch Extremadura’s’ monster carp. The nuts of carp fishing holiday. Spain's Extremadura region is definitely one of Europe's hottest carp venues, absolutely stuffed with monster wild carp in tip top conditions. Carp fishing doesn't get much better than this and Catch Carp Spain are the company to choose for your Extremadura carp fishing holiday. We will be back soon!